Russian pilot cosmonaut 1978-1997. 489 cumulative days in space. Call sign: Vityaz (Knight). Status: Inactive; Active 1978-1997. Born: 1947-03-29. Spaceflights: 4 . Total time in space: 489.06 days. Birth Place: Olginka, North Kazakhstan. Detachment: TsPK-7. Departed Date: 1997-05-30. Family: Cosmonaut. Country: Kazakhstan, Russia. Spacecraft: Salyut 7, Mir. Flights: Soyuz T-13A, Soyuz T-14 EO-4-c, Soyuz T-14 Salyut 7 EP-5, Soyuz T-15, Soyuz T-15B, Soyuz T-15C, Soyuz TM-2, Soyuz TM-2 Mir LD-1, Soyuz TM-3 Mir EP-1, Soyuz TM-7, Soyuz TM-8, Soyuz TM-13A, Soyuz TM-13, Soyuz TM-14A, Soyuz TM-14, Soyuz TM-14 Mir 92, Soyuz TM-19, Soyuz TM-20, Soyuz TM-20 Euromir 94. Agency: VVS. Bibliography: 6152. 1947 March 29 - . Birth of Aleksandr Stepanovich Viktorenko - . Nation: Kazakhstan. Related Persons: Viktorenko. Russian pilot cosmonaut 1978-1997. 489 cumulative days in space. Call sign: Vityaz (Knight). 4 spaceflights, 489.1 days in space. Flew to orbit on Soyuz TM-3 (1987), Soyuz TM-8, Soyuz TM-14, Soyuz TM-20..
1978 May 23 - . Soviet Air Force Cosmonaut Training Group 7 selected. - . Nation: Russia. Related Persons: Grekov, Viktorenko. Soyuz T-13A (cancelled) - . Crew: Savinykh, Vasyutin, Volkov, Aleksandr. Backup Crew: Aleksandrov, Saley, Viktorenko. Nation: Russia. Program: Salyut 7. Flight: Soyuz T-13A. Spacecraft Bus: Soyuz. Spacecraft: Soyuz T. A mission was planned from 1982 to operate the military experiments aboard TKS-3 after it had docked with Salyut 7. Salyut 7 problems resulted in a complete breakdown of the TKS-3 plans and the crew was split-up and launched on two seperate flights..
1985 September 17 - . 12:38 GMT - . Launch Site: Baikonur. Launch Complex: Baikonur LC1. LV Family: R-7. Launch Vehicle: Soyuz-U2. Soyuz T-14 - . Call Sign: Cheget (Tcheget - mountain in the Caucasus). Crew: Grechko, Vasyutin, Volkov, Aleksandr. Backup Crew: Saley, Strekalov, Viktorenko. Payload: Soyuz T s/n 20L. Mass: 6,850 kg (15,100 lb). Nation: Russia. Agency: MOM. Program: Salyut 7. Class: Manned. Type: Manned spacecraft. Flight: Soyuz T-13 EO-4-a, Soyuz T-13 EO-4-b, Soyuz T-14 EO-4-c, Soyuz T-14 Salyut 7 EP-5. Spacecraft Bus: Soyuz. Spacecraft: Soyuz T. Duration: 64.91 days. Decay Date: 1985-11-21 . USAF Sat Cat: 16051 . COSPAR: 1985-081A. Apogee: 223 km (138 mi). Perigee: 196 km (121 mi). Inclination: 51.60 deg. Period: 88.70 min. Docked with Salyut 7. Transported a crew comprising ship's commander V V Vasyutin, flight engineer G M Grechko and cosmonaut-researcher A A Volkov to the Salyut-7 orbital station to conduct scientific and technical studies and experiments. 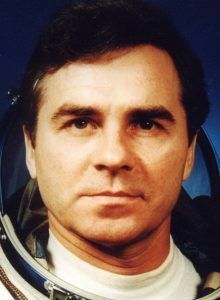 Grechko returned in Soyuz T-13 on 25 September 1985 - emergency return. Soyuz T-15B (cancelled) - . Crew: Aleksandrov, Saley, Viktorenko. Backup Crew: Moskalenko, Serebrov, Solovyov. Nation: Russia. Program: Salyut 7. Flight: Soyuz T-15B. Spacecraft Bus: Soyuz. Spacecraft: Soyuz T. Planned second crew to opeate TKS-3 military experiments aboard Salyut 7 before control of the station was lost. Salyut 7 and Cosmos 1686 burned up in the atmosphere together in a fiery show over Argentina on February 7, 1991..
Soyuz T-15C (cancelled) - . Crew: Dobrokvashina, Ivanova, Savitskaya. Backup Crew: Aleksandrov, Solovyov, Viktorenko. Mass: 7,150 kg (15,760 lb). Nation: Russia. Program: Salyut 7. Flight: Soyuz T-15C. Spacecraft Bus: Soyuz. Spacecraft: Soyuz T.
Cancelled all-female flight to be launched on International Woman's Day, to have docked with Mir or Salyut 7. Breakdown of Salyut 7, exhaustion of stock of Soyuz T spacecraft, and official resistance led to cancellation of the mission. Officially cancelled due to birth of Savitskaya's baby. No female cosmonauts would be in training again until a decade later. 1987 July 22 - . 01:59 GMT - . Launch Site: Baikonur. Launch Complex: Baikonur LC1. LV Family: R-7. Launch Vehicle: Soyuz-U2. Soyuz TM-3 - . Call Sign: Vityaz (Knight ). Crew: Aleksandrov, Faris, Viktorenko. Backup Crew: Habib, Savinykh, Solovyov. Payload: Soyuz TM s/n 53. Mass: 7,100 kg (15,600 lb). Nation: Russia. Agency: MOM. Program: Mir. Class: Manned. Type: Manned spacecraft. Flight: Soyuz TM-2, Soyuz TM-2 Mir LD-1, Soyuz TM-3, Soyuz TM-3 Mir EP-1. Spacecraft Bus: Soyuz. Spacecraft: Soyuz TM. Duration: 160.30 days. Decay Date: 1987-12-29 . USAF Sat Cat: 18222 . COSPAR: 1987-063A. Apogee: 353 km (219 mi). Perigee: 297 km (184 mi). Inclination: 51.60 deg. Period: 91.00 min. Manned three crew. Transported to the Mir orbital space station a Soviet-Syrian crew comprising cosmonauts A S Viktorenko, A P Aleksandrov and M A Faris to conduct joint research and experiments with cosmonauts Y Romanenko and A Laveykin. Maneuvered from initial 231 X 217 km orbit to Mir's 311 X 359 km orbit. Docked with rear Mir port at 3:30 GMT 24 July. Undocked with rear port 30 July and docked to forward port. 1987 July 30 - . Landing of Soyuz TM-2 - . Return Crew: Faris, Laveykin, Viktorenko. Nation: Russia. Related Persons: Faris, Laveykin, Viktorenko. Program: Mir. Flight: Soyuz TM-2, Soyuz TM-2 Mir LD-1, Soyuz TM-3, Soyuz TM-3 Mir EP-1. Undocked from Mir at 8:34 GMT on 29 July. The Orbital Module was jettisoned before retrofire and left in a 308 X 356 orbit. Soyuz TM-2 landed at 01:05 GMT with the crew of Faris, Laveykin and Viktorenko aboard..
1989 September 5 - . 21:38 GMT - . Launch Site: Baikonur. Launch Complex: Baikonur LC1. LV Family: R-7. Launch Vehicle: Soyuz-U2. Soyuz TM-8 - . Call Sign: Vityaz (Knight ). Crew: Serebrov, Viktorenko. Backup Crew: Balandin, Solovyov. Payload: Soyuz TM s/n 58. Mass: 7,150 kg (15,760 lb). Nation: Russia. Agency: MOM. Program: Mir. Class: Manned. Type: Manned spacecraft. Flight: Soyuz TM-8. Spacecraft Bus: Soyuz. Spacecraft: Soyuz TM. Duration: 166.29 days. Decay Date: 1990-02-19 . USAF Sat Cat: 20218 . COSPAR: 1989-071A. Apogee: 392 km (243 mi). Perigee: 390 km (240 mi). Inclination: 51.60 deg. Period: 92.40 min. Manned two crew. Mir Expedition EO-05. Docked with Mir 8 September. Transported to the Mir orbital station a team consisting of A S Viktorenko, commander of the spacecraft, and A A Serebrov, on-board engineer, to carry out scientific and technological research and experiments. Flight cost 80 million rubles. Expected return 25 million rubles net profit. 1990 January 8 - . 20:23 GMT - . EVA Mir EO-5-1 - . Crew: Serebrov, Viktorenko. EVA Duration: 0.12 days. Nation: Russia. Related Persons: Serebrov, Viktorenko. Program: Mir. Class: Manned. Type: Manned space station. Flight: Soyuz TM-8. Spacecraft: Mir. Installed star tracker..
1990 January 11 - . 18:01 GMT - . EVA Mir EO-5-2 - . Crew: Serebrov, Viktorenko. EVA Duration: 0.12 days. Nation: Russia. Related Persons: Serebrov, Viktorenko. Program: Mir. Class: Manned. Type: Manned space station. Flight: Soyuz TM-8. Spacecraft: Mir. Retrieved and installed material samples. 1990 January 26 - . 12:09 GMT - . EVA Mir EO-5-3 - . Crew: Serebrov, Viktorenko. EVA Duration: 0.13 days. Nation: Russia. Related Persons: Serebrov, Viktorenko. Program: Mir. Class: Manned. Type: Manned space station. Flight: Soyuz TM-8. Spacecraft: Mir. Tested spacesuit. Examined exterior of Kvant 2..
1990 February 1 - . 08:15 GMT - . EVA Mir EO-5-4 - . Crew: Serebrov, Viktorenko. EVA Duration: 0.21 days. Nation: Russia. Related Persons: Serebrov, Viktorenko. Program: Mir. Class: Manned. Type: Manned space station. Flight: Soyuz TM-8. Spacecraft: Mir. Serebrov tested SPK manoeuvring unit..
1990 February 5 - . 06:08 GMT - . EVA Mir EO-5-5 - . Crew: Serebrov, Viktorenko. EVA Duration: 0.16 days. Nation: Russia. Related Persons: Serebrov, Viktorenko. Program: Mir. Class: Manned. Type: Manned space station. Flight: Soyuz TM-8. Spacecraft: Mir. Viktorenko tested SPK manoeuvring unit..
1990 February 19 - . Landing of Soyuz TM-8 - . Return Crew: Serebrov, Viktorenko. Nation: Russia. Related Persons: Serebrov, Viktorenko. Program: Mir. Flight: Soyuz TM-8, Soyuz TM-9. Soyuz TM-8 landed at 04:36 GMT. .
Soyuz TM-13A (cancelled) - . Crew: Kaleri, Viehboeck, Volkov, Aleksandr. Backup Crew: Avdeyev, Lothaller, Viktorenko. Nation: Russia. Program: Mir. Flight: Soyuz TM-13A. Spacecraft Bus: Soyuz. Spacecraft: Soyuz TM. Soyuz TM-13 and TM-14 crews were reshuffled extensively due to commercial considerations and necessity of flying a Kazakh cosmonaut. This was the original crew assignment. Kaleri and Avdeyev were replaced by Kazakh researchers in the final crew..
1994 October 3 - . 22:42 GMT - . Launch Site: Baikonur. Launch Complex: Baikonur LC1. LV Family: R-7. Launch Vehicle: Soyuz-U2. Soyuz TM-20 - . Call Sign: Vityaz (Knight ). Crew: Kondakova, Merbold, Viktorenko. Backup Crew: Budarin, Reiter, Solovyov. Payload: Soyuz TM s/n 69. Mass: 7,150 kg (15,760 lb). Nation: Russia. Agency: MOM. Program: Mir. Class: Manned. Type: Manned spacecraft. Flight: Soyuz TM-18 Mir LD-4, Soyuz TM-19, Soyuz TM-20, Soyuz TM-20 Euromir 94. Spacecraft Bus: Soyuz. Spacecraft: Soyuz TM. Duration: 169.22 days. Decay Date: 1995-03-02 . USAF Sat Cat: 23288 . COSPAR: 1994-063A. Apogee: 395 km (245 mi). Perigee: 392 km (243 mi). Inclination: 51.60 deg. Period: 92.43 min. Mir Expedition EO-17. Docked at the Mir forward port at 00:28 on 1994 October 6. The Mir crew of Viktorenko, Kondakova and Polyakov boarded Soyuz TM-20 on January 11, and undocked from Mir's front port at 09:00 GMT. The spacecraft withdrew to about two hundred metres from Mir and then redocked in a test of the automatic Kurs system, which had failed in Progress M-24's attempted docking. Redocking came at 09:25 GMT. 1995 March 22 - . Landing of Soyuz TM-20 - . Return Crew: Kondakova, Polyakov, Viktorenko. Nation: Russia. Related Persons: Kondakova, Polyakov, Viktorenko. Program: Mir. Flight: Soyuz TM-18 Mir LD-4, Soyuz TM-20, Soyuz TM-21. Soyuz TM-20 landed 22 km northeast of Arkalyk in Kazakhstan at 04:04 GMT with crew of Viktorenko, Kondakova and Polyakov aboard..